Here at fatal accident claims we have considered that even a token value for the loss of a loved one following a fatal accident compensation claim (known as a bereavement award) of £12,980 is too low. Yes no amount of money following the death of a close family member can compensate for the loss but to put the “token” value (set by the Government) at such a low level is quite simply an insult to grieving families. Often we are involved in conversations with families who have lost a loved one to explain to them that the value society (the Government) have placed on a family member is not suppose to compensate their loss but it is simply a marker or token of the loss. This is not right. Anyone killed following a fatal accident, being a fatal car accident claim or a fatal accident at work claim must have more than simply a token amount to represent the worth of such a priceless loss. To offer a token is an insult. Yes we appreciate that the insurance industry (who will pay the bereavement award, not the Government) will not be able to provide £Millions in compensation just for the death alone, but at least provide an amount that is beyond a token. 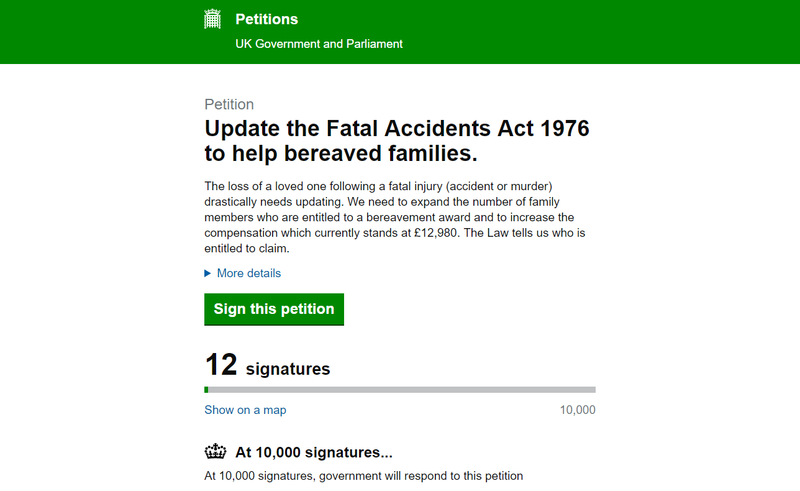 At fatal accident claim solicitors we have today lodged our E-Petition to increase the fatal accident bereavement award to £100,000. It is still a token amount but not such an insult that grieving families have to endure as the law currently stands. Click our Bereavement E – Petition now and this will take you to the Government Website. We need 100,000 votes for our petition to be debated by the Government. Please contact us or re-tweet this page to lend your support or go on line and search for our bereavement E-Petition. The following links will provide more crucial information on why a bereavement compensation is unjust. Please send some time to click on each link below.